Born in 1963 and educated in Scotland, Jacqueline Stanhope has been painting and selling horse portraits in oils since childhood. By the age of fourteen she had already executed her first commission, a portrait of legendary race horse Nijinsky. Established as one of the finest equine and canine artists, Jacqueline’s artwork can be found in collections the world over. 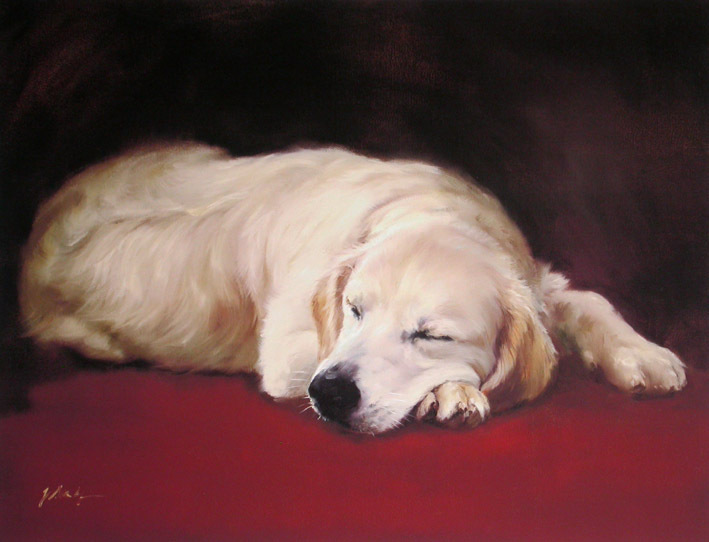 For the Fine Art Trade Guild exhibition she prepared a beautifully observed oil painting of her own greyhound asleep. Both striking and gentle, this lovely portrait is typical of the 'close-up-and-personal' style that is the Stanhope trademark.